If you’re tired of dealing with a finnicky, inefficient air conditioner and sky-high utility bills, it’s time to look into air conditioner installation and replacement in Lake Norman. On a good day, your air conditioner keeps your home at a tolerable temperature. On a bad day, you feel like the humidity in your home is going to overtake you and you wish that you lived somewhere cool. If you’re tired of dealing with a finnicky, inefficient air conditioner and sky-high utility bills, it’s time to look into new air conditioner installation in the Lake Norman, North Carolina area. Here at Cool Comfort Heating & Air, we can help with all phases of the air conditioner installation process. From sizing your new unit to complement your cooling needs and the size of your home to ensuring your new system works flawlessly, we complement every stage of the installation process with effective workmanship and excellent customer service. Once we install your new air conditioner, we hope you turn to us whenever you need help with your system. We offer regular maintenance, as well as a wide range of repair options. If your air conditioner ever stops working as it should, count on our team to provide the reliable, superior service you expect out of your HVAC contractor. 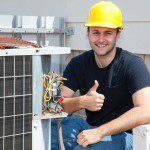 When it comes to air conditioner installation, repair, and maintenance services, you’ll be more than glad you decided to work with our team here at Cool Comfort Heating & Air. To find out more about the services we offer and what sets them apart, please don’t hesitate to give us a call.